Done. I also recorded the score of the first @js619 vs @robthomasson match. I’m into the finals after picking up key cards at just the right time from the magic PEZ dispenser against both @johnl and @rinelk. Legion of Aklys, in particular, is pretty ridiculous. As I’m sure Kelsey would agree. You can say that two times. I was just playing along, minding my own business, then I’m waking up in a bathtub full of ice with no kidneys. 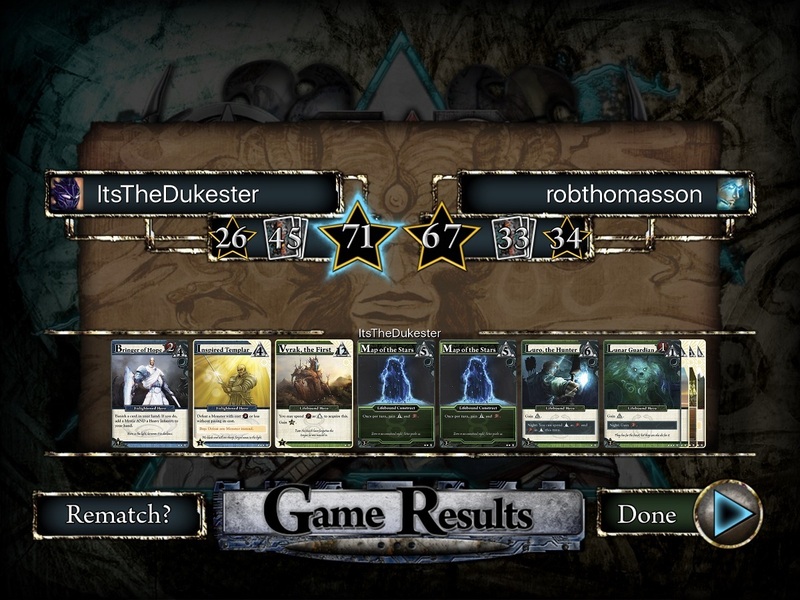 @robthomasson and I just finished game 2… I saw the notifications pop up that a game had ended and that Rob wanted to play a game - figured I had won, which I did 77-65. Exactly tied on VPs, 30-30! Game 3 handily went to @robthomasson, 96-54. I felt this one getting away midway through when he used the 4 card that allows you to defeat any monster when it’s day to take the 7 monster which then gives you two VPs for taking night cards… seems a large percentage of games are won by that guy. Great game! I’m off to maybe learn the names of the cards in this one… maybe. By the time I got that “That guy” (Legion of Aklys) I believe that I already had the advantage but he iced my bun (as it were) and could certainly have been a problem if he gone to @js619. I still have no game plan for this expansion but clearly this game fell right for me. Thanks to @js619 for a great series … and onward to @TheDukester. Oh, it is on like Centipede. First round of the bronze match went to me, 82-74. I led VPs most of the game, but @rinelk built up a healthy supply of Mechana constructs and it stayed day for a few turns towards the end, leading to a closer game than I anticipated! Good game, onto round 2/3. First blood in the final to @TheDukester … a clear win. … and I almost missed it. I was so focused on which monster to kill. I’m pretty sure that’s the first time I’ve gotten Vyrak in a competitive game. Very well played match, @js619! I felt like the final score made the game look closer than it was–I felt doomed for the whole second half of the game. A well-earned bronze for @js619! I took the second round of the Bronze match, 115-102. Highest scores I’ve seen yet in this game, and the first time the Mechana constructs worked for me - we both had decent constructs going, and I’m honestly not sure what accounted for the 13 point difference. Might have been the construct that allowed me to always treat my turn as day - there were several turns where I was drawing ten plus cards. This was the first game that I felt like I had a strategy and an engine going. Great game, @rinelk, and great tournament all around! Ehrmigerd! Vyrak, FTW. I got a result, as our British friends say, even though it wasn’t totally deserved. I got past @robthomasson in both games of the finals. The magic PEZ dispenser loves me again. Here’s Game 2 – note that I got a cheap 10 points from Vyrak, Guy Who Lets Who Win … and note the four-point difference. Good games, Rob. And good tournament, everyone. I should retire from competitive Ascension at this very moment. Well played by @TheDukester … a solid thumping in two well played games and a deserved tournament win. Thanks to @geigerm for organising and to all involved. Congrats to @TheDukester for the win, and thanks to all of you for playing! I was completely serious starting about a DoC/WoS tourney next, as mentioned a few weeks ago. Want to wait for a bit, or should I post signups right away? I’m always game for more Ascension!